This book results from the PhD thesis, in a very reshaped version. It has been published mid-June 2005 by Éditions IRD, in the À travers champs series headed by Jean Boutrais, director of research at IRD. Read the book document on the Éditions IRD web site (and possibly order the book). The main subject is to understand by an anthropological approach the uses of the oasian environment, its construction, and the invention of natures in the Sahara’s oases, especially in the Jerid region, Southwest Tunisia, with comparisons with Djanet in the Tassili n’Ajjer (Algeria), and Zagora in the Wadi Draa (Morocco). The presence of oases in the Sahara can seem as an ecological aberration. The palm plantations, and the gardens which they shelter, are in fact the fruit of a millennial conquest, which continues today. These artificial landscapes, “terroirs” carefully worked and maintained, are the prototype of anthropized natural systems. This book has been written from on-the-ground research carried out in Tunisian Jerid, but also in Tassili n’Ajjer (Djanet, Algeria) and in the wadi Draa (Zagora, Morocco). If this comparative perspective reveals the diversity of the oasian practices and knowledge and of the relations to the environment, it also emphasizes the local dynamics, which unfold beyond the usual dualism between tradition and modernity. 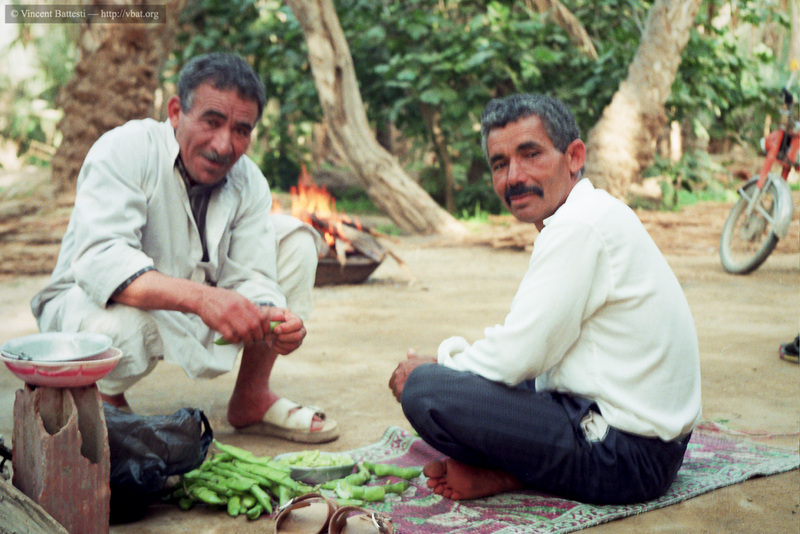 In addition, several scales of study, from the vegetable bed to the garden and from the plot of land to the whole palm grove, make it possible to underline the variety of the articulations between ecological, economic, and social factors in oasis. This work deals with the question of the relations between oasian societies and their environments. It concentrates essentially on the agriculture of the palm groves of Jerid (or Djerid) in the Tunisian South (Tozeur, Degache, El-Hamma, Nefta, Castilia, Dghoumes, etc. ), while comparing their situation with Moroccan and Algerian oases, from an ethnographical inquiry taking part into a program of rural development. The ambition is to characterize minutely the agriculture invented and practised in oasis and besides to better understand in what this form of agriculture and these oasian landscapes are due to the “environmental constraints” and\or in the “cultural influences”. Does the oasian situation recover from a primacy of the nature or from the culture? Beyond the aporia of this Manicheanism (determinism against culturalist hermeneutic), the precedences of the ecological or the social are estimated through a spatial hierarchy, from the garden to the oasis as a whole. The work consisted in revealing different layers of sense, contrasted strategies, sometimes contradictory types of practices, according to the levels where oases are lived and perceived by individuals and institutions with often divergent interests. These Saharan oases are strange spaces: greenery spots in a hostile desert environment. The anthropological survey shows us how they are created by human hand and how, at the same time, they are beyond local communities, as appropriate by a modern state but also by tourism. Two documents are available: the table of contents (in French) of the book and the cover design of the book (pdf format). Table des matières de Jardins au désert. 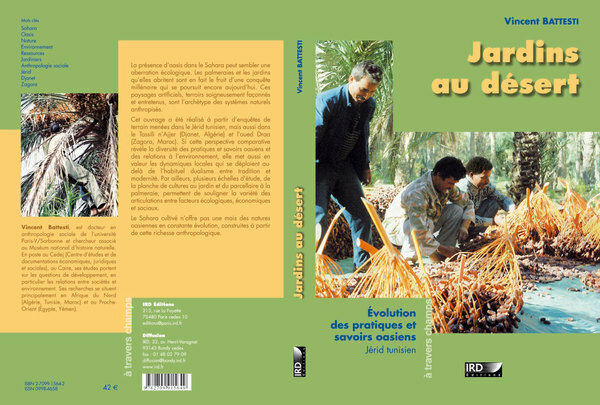 Couverture de Jardins au désert. 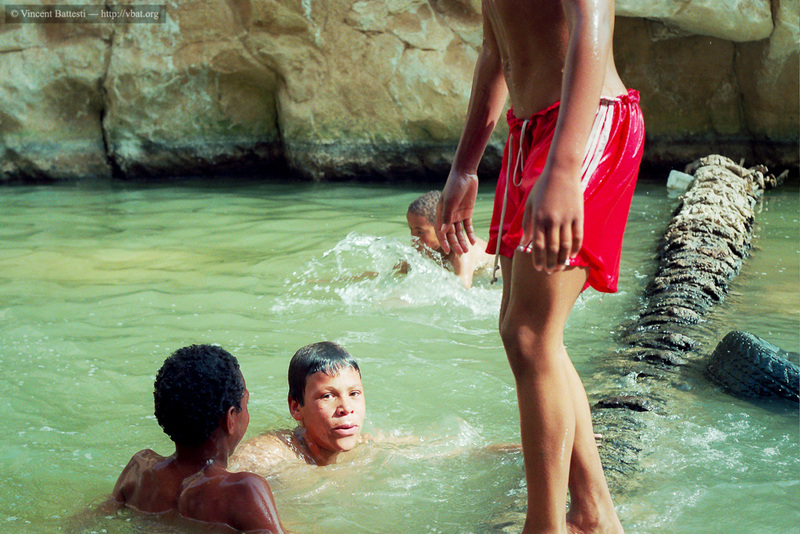 Oasis de Tamerza (Jérid), Tunisie, © Vincent Battesti, 1995. 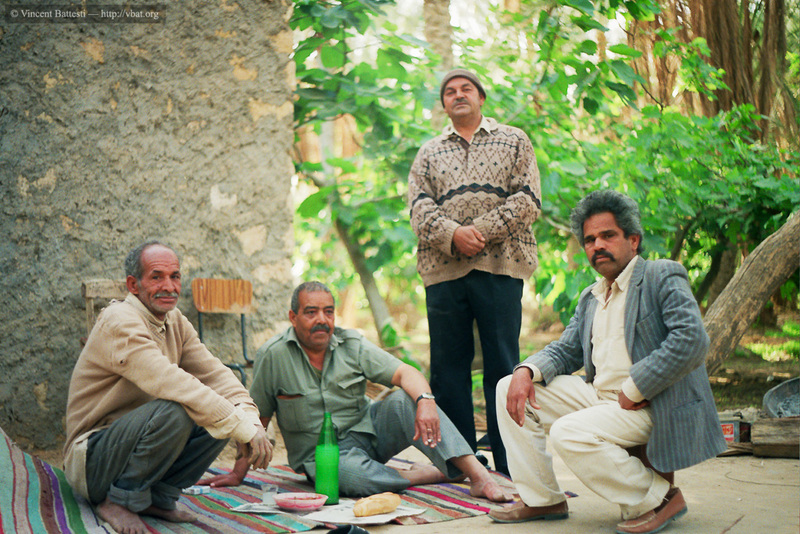 Oasis de Degache (Jérid), Tunisie, © Vincent Battesti, 1995. To purchase this book on Amazon.fr, on Alapage.com, on Chapitre.com, or on Fnac.com. This article has been read 10635 times. Dernière mise à jour de cette page le Tuesday 29 August 2017 à 6:59:11. //// -----> Citer cette page? Vincent Battesti, "Gardens to the desert, Evolution of Oasian practices and knowledge, Jerid, Tunisia" [en ligne], in vbat.org anthropoasis, page publiée le 21 June 2005 [visitée le 20 April 2019], disponible sur: http://vbat.org/spip.php?article52.